UCLA researchers have redefined the concept of a microscope by removing the lens to create a system that is small enough to fit in the palm of a hand but powerful enough to create three-dimensional tomographic images of miniscule samples. The advance, featured this week in the early online edition of the journal Proceedings of the National Academy of Sciences, represents the first demonstration of lens-free optical tomographic imaging on a chip, a technique capable of producing high-resolution 3-D images of large volumes of microscopic objects. "This research clearly shows the potential of lens-free computational microscopy," said Aydogan Ozcan, senior author of the research and an associate professor of electrical engineering at UCLA's Henry Samueli School of Engineering and Applied Science. "Wonderful progress has been made in recent years to miniaturize life-sciences tools with microfluidic and lab-on-a-chip technologies, but until now optical microscopy has not kept pace with the miniaturization trend." An optical imaging system small enough to fit onto an opto-electronic chip provides a variety of benefits. Because of the automation involved in on-chip systems, scientific work could be sped up significantly, which might have a great impact in the fields of cell and developmental biology. In addition, the small size not only has great potential for miniaturizing systems but also leads to cost savings on equipment. The optical microscope, invented more than 400 years ago, has tended to grow larger and more complex as it has been modified to image ever-smaller objects with better resolution. To address this lack of progress in miniaturization, Ozcan's research group — with graduate student Serhan Isikman and postdoctoral scholar Waheb Bishara as lead researchers — developed the new tomographic microscopy platform through the next evolution of a lens-free imaging technology the group created and has been improving for years. Ozcan, a researcher at the California NanoSystems Institute at UCLA, makes the analogy that a traditional optical microscope is like a huge set of pipes delivering content, in the form of images, to the user. Over years of development, bottlenecks occur that impede further improvement. Even if one part of the system — that is, one bottleneck — is improved, other bottlenecks keep that improvement from being fully realized. Not so with the lens-free system, according to Ozcan. "Lens-free imaging removes the pipes altogether by utilizing an entirely new design," he said. The system takes advantage of the fact that organic structures, such as cells, are partially transparent. So by shining a light on a sample of cells, the shadows created reveal not only the cells' outlines but details about their sub-cellular structures as well. "These details can be captured and analyzed if the shadow is directed onto a digital sensor array," Isikman said. "The end result of this process is an image taken without using a lens." Ozcan envisions this lens-free imaging system as one component in a lab-on-a-chip platform. 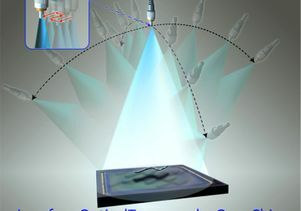 It could potentially fit beneath a microfluidic chip, a tool for the precise control and manipulation of sub-millimeter biological samples and fluids, and the two tools would operate in tandem, with the microfluidic chip depositing and subsequently removing a sample from the lens-free imager in an automated, or high-throughput, process. The platform's 3-D images are created by rotating the light source to illuminate the samples from multiple angles. These multiple angles also allow the system to utilize tomography, a powerful imaging technique. Through the use of tomography, the system is able to produce 3-D images without sacrificing resolution. "The field of view of lens-based microscopes is limited because the lens focuses on a narrow area of a sample," Bishara said. "A lens-free microscope has both a much larger field of view and depth of field because the imaging is done by the digital sensor array and is not constrained by a lens." 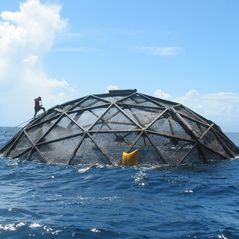 The research was funded by grants from the National Science Foundation, the U.S. Office of Naval Research and the National Institutes of Health and was also supported by the Gates Foundation and the Vodafone Americas Foundation. For more information on the Ozcan research group, visit http://innovate.ee.ucla.edu/. 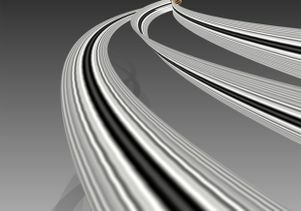 Artistic rendering of a sample being tomographicaly imaged, showing the individual sections.